Having read Ruth Ware's other two novels, I must say I think this is her best so far. Isa, Thea, Fatima and Kate are four school friends who met at Salten House boarding school just outside London in the 1980s. 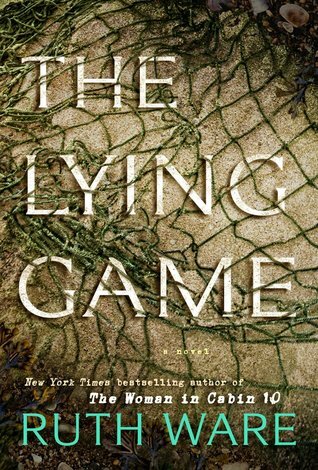 They participate in The Lying Game, a game which provides a bond for them as they form a kind of clique, isolating themselves from the other girls and the local townspeople. The story is told from the Isa's point of view, a lawyer with a small baby, Freya, who, like her friends, receives a note from Kate saying "I need you." So they meet at the Mill, not far from Salten school, where Kate grew up with her father, an art teacher, and her stepbrother, Luc. Her three friends would visit, drinking wine and posing for Ambrose, Kate's father who went missing under suspicious circumstances. Fast forward to their reunion, which coincides with a school reunion which they attend reluctantly; these girls all left the school under a cloud of shame/suspicion and are not exactly welcomed back with open arms. Coincidentally, a bone is discovered in the marsh near the Mill, and we learn very soon it is the body of Ambrose in the bog. The suspense lies in finding out why Ambrose died. Was it suicide? Murder? What are these expert liars covering up and why? None of the characters are particularly likeable, but the story's strength lies not in its characterization so much as its carefully crafted plot, which moves along supported with solid descriptions of this almost haunted/gothic locale. I read this in a few days but could well imagine having enjoyed it in a single sitting, as one reviewer noted. Read anything good lately? Email your book reviews & recommendations to allison.girard@sd68.bc.ca to be featured on the LSS Library Books & Reading Blog!